The Run was planned 2 weeks before Christmas by me. 12 rides been participated in this event and its was the last touge for 2010. Rides in this event was 120y, Turbo and N/A Kancil, 3 Satria’s, Neo, EG6, Wira, Kelisa, Swift Cultus, & Saga BLM. New comer for Touge-G event was Herman which drove an EG6, Shafeq drove Swift Cultus and Amir who’s drove Saga BLM. 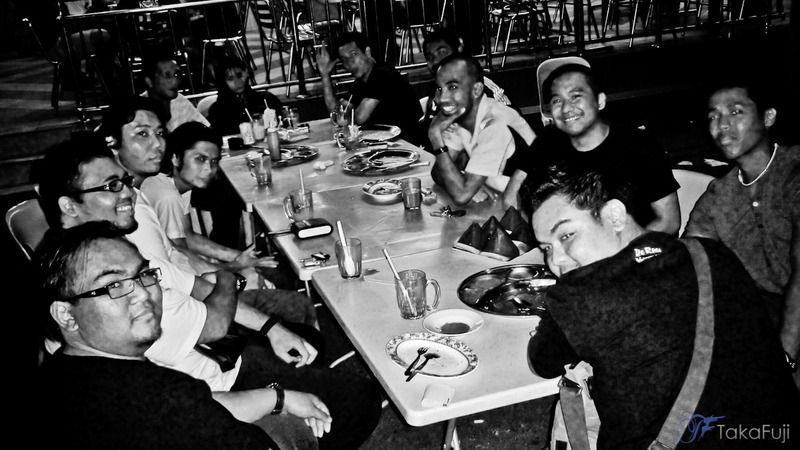 Some of us meet-up at Bistro as usual place, while shalie, azim, herman and Shafeq was met-up at Twin Shell MRR2. Herman who’s suppose went up to Genting accidentally met shalie and the gang at Twin Shell then he decide to run with us. On 12.30 we all move up to Gombak bt12 bridge before start. I hook-up in Fazham ride as Cameraman. After everyone arrived and finish chit-chat at bridge, we all start our run to sempah at 12.58am. At First sight at starting S corner, Yellow Kancil lead the first group followed by shalie, azim, jasril, herman and kudut. They taking fast on the 1st corner. While the second group was lead by Hilmi Konmei followed by zoul, Shafeq and Amir BLM if I’m not mistake (^.^) then last car from bridge was Wak Rizal which cruising speedy in solo. Fazham and me get in the car after captured the scenes at 1st S Corner’s and try to follow them, but unlucky they was disappear in our sight. Fazham which still fresh on touge cannot attack corner too fast he still not understand well in Sempah Touge when nobody on the front. 300metres before reach Sempah bridge I got a call from unknown number and he told that his car was fall in ravine but we don’t know which ravine is it. Fazham drove slow to check all corners ultil we reach at Sempah Roundabout but still don’t find any clue. As arrived there I ask them about guy fall in ravine then we check on each other. OMG! Where is Mr Kudut the White Satria. We headed back to downhill to search for him and found him at “U Ravine Hairpins”. 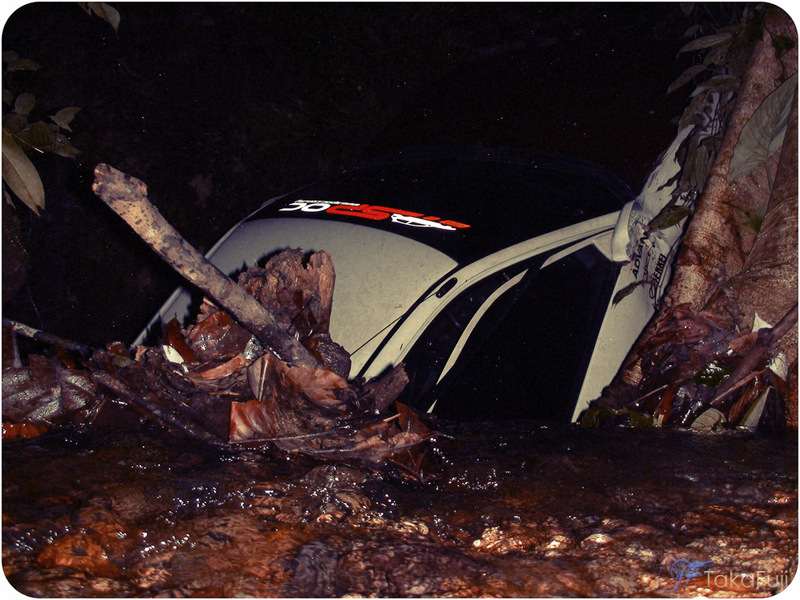 His car was fall about 150m deep inside ravine, drive and passenger was safe. From his story, his car failed to turn while enter the hairpins and falls from back of his car. He throttled a bit through 200m straight without notice a hairpin ahead. There was a small river at the back and the car stacked there, while driver and passenger manage to go up back. Jasril called a friend known as Pak Shukur for help, Pak Syukur come and called up a tow truck from sempah to get the car up back to the road. I’m gone down to capture video and picture. After a while of waiting, tow truck came. About 15 minutes, there car was succeed to pull over. Then WEX was tow to Sempah workshop and we back to Bistro for drink and chit-chat. For WEX, this for the 3rd times he went into darkness in this year. A Car we can fix back if got damage, but a LIFE! We Cannot gamble with it. This was last run for 2010. Even we not finish the run to Awana, but at least some of runner had a new experience with it. Please, please and please.. Don’t get to fast to catch a front car if we hard to, doesn’t need to push and get tension when touge. Just calm and be relax have a fun with Touge. Here some of photos that I can snap-snap. See you all in 2011. This year we had a lot of run from January till the end of year 2010. Thanks for friends who’s invite us be together in touge. From here we made friend and share the moment in same interest. Not forgot to our friend, Mr Shazwan who gone forever after had a crashed at Karak Highway. We will miss you and may the God bless you. For the last words from us, Merry Christmas and Happy New Year! hope next year would be better..drive safe n enjoy ! yes bro..im the one whos comin late :p(cant made it to genting sempah run) never run with u guys before..remembered tat day u guys said drive slow(dunno ur definition of slow) up to mamak stall?..but everyone speed up and i was left behind haha..
hihi.. their slow is fast.. :p It’s great u came together also. Its okay whateva ride we drive as long we know how to drive it 😉 we always welcome new friend who want run and have fun together.